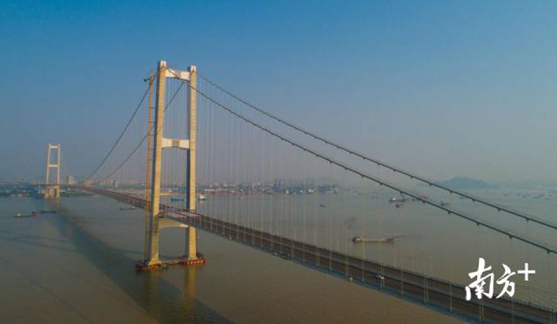 The Nansha Bridge, which will be the first super project to be opened for use after the announcement of the Guangdong-Hong Kong-Macao Greater Bay Area Development Plan, is scheduled to open to traffic on April 2nd. For a private vehicle, the one-way fare is 42 Yuan. The Nansha Bridge connects Guangzhou and Dongguan and is expected to handle 120,000 vehicles per day, exceeding the design standard of 80,000 vehicles. It will effectively relieve the pressure now on the Humen Bridge. The journey from Guangzhou Nansha to Dongguan Humen will be shortened from over 60 to 15 minutes. According to Nanfang Daily, the Nansha Bridge will connect with Guangzhou-Macao Expressway (G0425), Seagull Road (S296), Port Road and Guangzhou-Shenzhen Riverine Expressway (S3), with three interchanges in Dongchong, Seagull Island and Shatian. If you start off from Guangzhou, you can drive over the bridge via Dongchong Interchange. If you set out from Zhongshan, Zhuhai and Macao, you can go through Guangzhou-Macao Expressway and go via Dongchong Interchange. While if you depart from Dongguan, Shenzhen and Hong Kong, you can get to the bridge via Mintian Interchange. In future when the Panyu-Dongguan Expressway open to traffic, you can go via Shatian Interchange. Last week (On March 18th), Guangdong government approved the standard for tolls on the Nansha Bridge. According to the approval, tolls need to vary by different vehicle types classified by Chinese national uniform standard. The toll rates for classification Ⅰ to Ⅴ are 1, 1.5, 2, 3, and 3.5 respectively. Passenger cars shall pay tolls on a pay-per-trip basis, and trucks shall pay by weight. 1.Trucks are classified according to the rated load (kilogram) approved by the national competent administrative authorities. 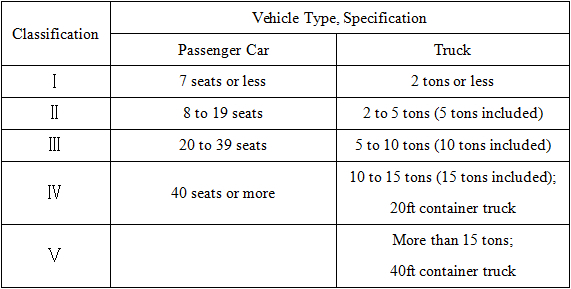 2.Passenger cars are classified according to the number of seats approved by the national competent administrative authorities. 3.In case that one vehicle tows a trailer, the combination vehicle shall be classified into the classification higher than that of the towing vehicle. 1.Passenger cars with more than 40 seats shall pay the tolls in accordance with the classification Ⅲ. 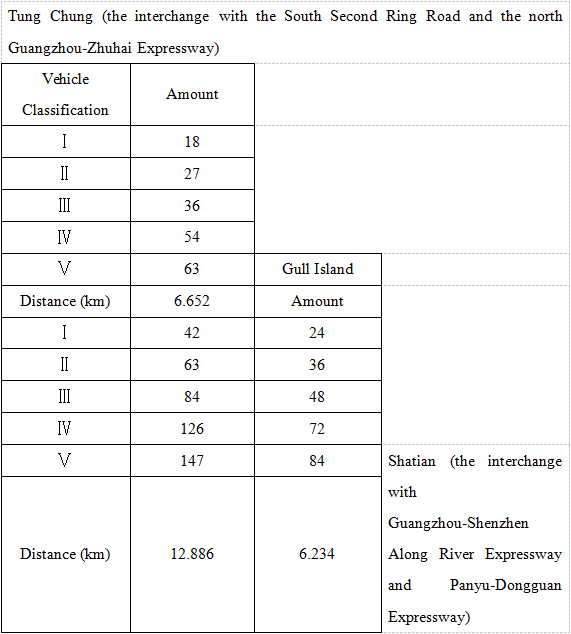 2.Based on the weight-tolling principle, trucks shall pay 0.54 yuan per ton-kilometer from Tung Chung interchange in HK to Gull Island in Guangzhou and 0.77 yuan per ton-kilometer from Gull Island in Guangzhou to Shatian interchange in Dongguan. Implementation shall be in accordance with the regulations of Guangdong Provincial Communications Department, and Guangdong Development and Reform Commission Transportation and Toll Letter (2015) No. 1031 and No. 1130.